(Nanowerk News) In a country of abundant sunshine and seawater, looking to the sun to turn the UAE’s saltwater into freshwater seems an obvious choice. However, researchers at the Masdar Institute are considering another renewable energy source that is sitting right under our feet – geothermal energy. Like the sunlight hitting the earth every day, the energy available from the heat of the earth, known as geothermal energy, is an enormous and largely untapped renewable resource. In fact, it would take just a fraction of the heat produced below the earth’s crust each year to provide the entire world’s electrical power needs, without emitting any harmful greenhouse gases into the atmosphere. In response to the potential role geothermal energy can play in helping the UAE maximize its utilization of locally available renewable energy resources, Masdar Institute researchers have conducted a study to determine how economically and technically feasible it would be to leverage this ample, carbon-free renewable resource to provide energy for perhaps the country’s most critical need – the production of freshwater from seawater, which is currently achieved via energy intensive desalination plants. Masdar Institute Researchers Conduct Feasibility Studies to assess potential for making Geothermal Energy-Powered Desalination and Cooling a Reality in the UAE. “In the UAE, seawater desalination is one of the largest consumers of the country’s generated power. It is estimated that nearly 30% of the fuel consumed by the UAE’s cogeneration natural gas-fired power plants is used to produce freshwater,” said Masdar Institute’s Dr. Hassan Arafat, Professor of Chemical and Environmental Engineering. Dr. Arafat and Savvina Loutatidou, Research Engineer and Masdar Institute MSc alumna, conducted a feasibility study on utilizing geothermal energy to desalinate water that was published last year in the journal Desalination. Not only is seawater desalination a heavy energy user, it is the country’s biggest greenhouse gas contributor. According to the 2015 UAE State of Energy Report, the UAE’s combined power generation and water desalination plants are the country’s largest CO2 emitters, accounting forone-third of the total greenhouse emissions, or roughly 65 million tons of greenhouse gases per year. Thus, turning to renewable sources like geothermal energy for providing energy for freshwater production is critically needed to reduce the country’s carbon footprint. “Through a comprehensive process of design modeling and economic and technical evaluation, we determined that geothermal energy would be a reliable way to supply a steady output of freshwater at a much lower environmental cost,” Dr. Arafat explained. Dr. Arafat and Loutatidou conducted a techno-economic analysis of two different types of seawater desalination plants – reverse osmosis (RO) and multiple effect distillation (MED) – powered by geothermal energy, to determine the levelized cost of water (LCOW), or the average cost to produce one cubic meter of water, for each technology. RO plants remove salt from seawater by pushing the water under pressure through a semi-permeable membrane that allows water molecules through but blocks the dissolved salts. MED plants on the other hand, obtain fresh water by repeatedly boiling seawater in a sequence of vessels and recovering the potable water vapor from each vessel. Most of the UAE’s desalination plants are cogeneration plants, which utilize two techniques – multi-stage flash (MSF) and MED – to turn seawater into freshwater. These cogeneration plants first produce electricity, and then use the waste heat from electricity generation as energy input to MSF or MED systems. “By using the UAE’s geothermal energy, new desalination plants could be designed as stand-alone plants, rather than having to be coupled with power plants. This decoupling of power and water opens up the potential of using a range of desalination technologies that are more energy-efficient and potentially powered by renewable energy sources such as solar and geothermal. A potential advantage of geothermal is that it can provide energy for desalination continuously while solar energy cannot without a coupled energy storage technology,” explained Dr. Steve Griffiths, Vice President for Research and Associate Provost, Masdar Institute. The team’s findings reveal that the LCOW for geothermal-powered RO is US$2.06 per cubic meter of water, while the LCOW for geothermal-powered MED was calculated at US$2.48 per cubic meter. Although current annual costs of freshwater produced via natural gas-powered RO in the UAE are between US$1-US$1.40 per cubic meter, and between US$1.20-US$1.60 for natural gas-powered MED, the UAE’s access to inexpensive sources of natural gas for power and fresh water production has become limited. The country has been a net importer of natural gas since 2008 and is increasingly relying on liquefied natural gas imports to meet demand for natural gas. “While not yet an economically viable alternative to conventionally powered RO desalination at current energy prices, these two geothermal-based schemes still show potential to be a cost-effective method of renewable desalination in the UAE,” Dr. Arafat asserted. The expected continued volatility and uncertainly in fossil fuel prices, coupled with a commitment to decrease carbon dioxide emissions and improve the country’s overall sustainability could make geothermal-powered desalination not only more environmentally beneficial, but also more economically favorable as well. Evaluating the economic feasibility of geothermal energy to power RO and MED desalination is a critical step towards making geothermal-powered desalination a reality. Feasibility studies such as the one undertaken by Dr. Arafat therefore play a key role in driving the development of sustainable technologies in the region. 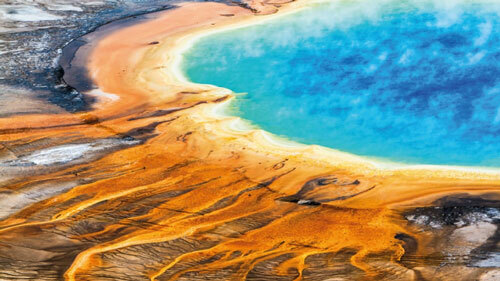 The study first required a detailed technological and economic analysis of a geothermal field. Reykjavik Geothermal (RG), a leading company in geothermal power development, had previously assessed the geothermal resources of the Middle East to be within the range of 90-150° Celsius. This temperature range means that the UAE’s geothermal energy resources are generally not adequate for efficient power generation. However, such resources can nonetheless be used to produce power via a binary cycle system, which uses the hot water pumped from the well to heat a secondary fluid that has a lower boiling point than water, so it is more easily converted into steam to turn a turbine. Important parameters that affect the performance of a geothermal field include its well productivity, which is determined by the flow rate and temperature of the water coming out of the well. These parameters and others, including maintenance costs, were used to determine the geothermal field’s potential financial cost and power performance. After the technical design and modeling of the geothermal field, the researchers modeled the coupling of the geothermal field to desalination plants using either electrical or thermal energy for the primary desalination operation. For RO, a binary cycle system is used to cover its electricity needs, which includes pumping the high-pressure seawater across the membranes. In the case of the MED plant, the geothermal heat energy is used to heat the seawater directly, while the electrical energy required to pump the water from one vessel to the next would be provided by a utility-scale photovoltaic (PV) plant or other source for providing small amounts of electricity. Finally, a number of important parameters that could alter the results of the analysis were investigated further, including seawater quality, operational lifetimes of both the geothermal and desalination systems, quality of the geothermal resource, cost of well-drilling and reinjection of the wells. Ultimately, Dr. Arafat and Loutatidou developed a robust model that assessed the technological and economic viability of RO and MED geothermal-powered desalination plants; a research endeavor that provides a foundation for further research and development of this potentially valuable UAE clean energy resource. The assessment of geothermal energy at Masdar Institute is not limited to just applications for freshwater production. A second study currently being conducted at Masdar Institute is looking into the feasibility of using geothermal energy for the UAE’s biggest consumer of electrical power – cooling. Dr. Afshin Afshari, Masdar Institute Professor of Practice of Engineering Systems and Management, is conducting a model-based feasibility analysis to assess the performance and cost-effectiveness of using geothermal energy for a district cooling system in Abu Dhabi’s low-carbon city of Masdar City. Earlier testing of Masdar City’s deep geothermal wells demonstrated that the vast hydrothermal resource located about 2.5 km below ground can generate up to 100 liters per second of hot water – between 90°C to 95°C – and produce 10 MW of thermal energy 24 hours a day, seven days a week. In contrast to other renewable intermittent resources, like the sun and wind, geothermal energy is continuously available and this has great value for applications such as district cooling. Using these parameters, the ongoing research study aims to model the technical and economic feasibility of a geothermal-powered absorption cooling plant that the researchers believe could reduce electricity consumption by as much as 15 to20% in a location such as Masdar City. The findings and ongoing feasibility studies from Masdar Institute are aimed at providing the UAE with the insights it needs to fully leverage its full spectrum of renewable energy resources to sustainably meet the country’s rapidly growing water and energy needs.